All Seasons Racing Service representative Shunile Haniff hands over the cheque for an undisclosed sum to Organiser Mark Wilshire on Tuesday. Senior Organising Secretary of the Georgetown Domino Association (GDA) Mark ‘Jumbie’ Wiltshire-organised ‘Champion of Champions’ Competition scheduled to commence on Sunday, June 3, at the R&R Sports Bar situated at 76 Meadow Brook Gardens, has attracted another sponsor. On Tuesday, All Seasons Racing Service on Robb Street joined the growing list of supporters of the tournament when representative, Shunile Haniff, handed over an undisclosed sum to Wiltshire at the entity’s location. 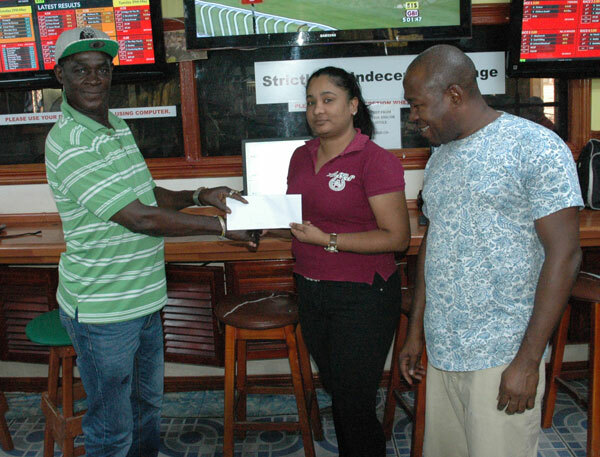 Wiltshire, shortly after thanking the entity for its support, said the tournament will see teams that finished first and second in competitions this year battle invited teams from the three counties in Demerara, Berbice and Essequibo. The experienced domino executive said over $300,000 in prize monies and trophies will be up for grabs with the winning team set to receive $175,000 and a trophy, while the second, third and fourth place finishers will take home $75,000, $35,000 and $20,000 respectively, along with trophies. Entrance fee is $12, 000 per team which must be paid on or before the start of play. The top female player and the Most Valuable Player will receive $5,000 respectively. Wiltshire added that all prizes are guaranteed and interested teams can contact him on tele#665-5855. Among the teams anticipated to participate are: Gold is Money, All Seasons, Mix Up, Spartans, Rage, Providence, Gangster, C7, C6, Thunder, Phantom, R&R, Turning Point, Masters, Gold Star, Angels and OPKO. The invited teams are: Orange Walk, NIS, East Taxi Service, Sun Flower Hotel out of Essequibo, Rockets, Players, Uprising, Mark Fitness Gym, Yhip’s Bakery, Lippy Lotto from Bartica, Golden Masters, Beacons, Medi Care, Geology & Mines Commission, Caricom, Lil Boys and Lion. Some of the sponsors include: Dynasty Sports Club, All Seasons Racing Service, Tony’s Jewellery, CBB&L Import & Export, South Land Trading and Boston Casting Jewellery among others. Food and drinks will be on sale throughout the day.